WASHINGTON (March 21, 2012) -- Even with the eventual drawdown in Afghanistan, traumatic brain injury will continue to be a problem for the Army. "Traumatic brain injury, or TBI, is not just an event unique to deployment," said Col. Nikki L. Butler, director of the Army Rehabilitation and Reintegration division, part of Army Medical Specialist Corps. "These injuries occur at airborne school, basic training, or in motor vehicle accidents. Some 84 percent of TBI is happening in garrison, it's not just an IED blast that causes TBI. It's bigger on the garrison side than on the deployed side. Just because we're going to come out of Afghanistan doesn't mean TBI is going to go away." Maj. Sarah B. Goldman, director of the Army's Traumatic Brain Injury Program and Col. Nikki L. Butler, director of the Army Rehabilitation and Reintegration division, speak with visitors to the Army's booth at the "Capitol Hill Brain Injury Awareness Day," March 21, 2012, on Capitol Hill, in Washington, D.C.
Butler manned an informational booth at the Rayburn House Office Building on Capitol Hill in Washington, D.C., March 21. Representatives of the Army and more than a dozen other organizations set up shop to educate the public about traumatic brain injury. The Army Medical Command set up a booth "to raise awareness about all of the Army's efforts for brain injury," said Maj. Sarah B. Goldman, of the Army Medical Specialist Corps. Goldman is the director of the Traumatic Brain Injury Program, part of the Rehabilitation and Reintegration division. "The Army has invested over $650 million in TBI research and we have enormous TBI educational efforts worldwide," Goldman said. "The Army is a leader within the Department of Defense for TBI prevention, awareness, treatment, and research." 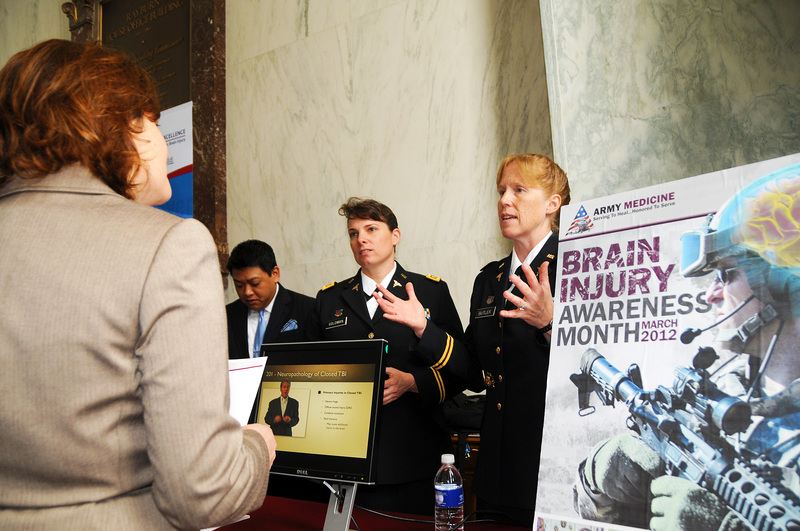 The event was part of the "Capitol Hill Brain Injury Awareness Day," which included both the informational TBI fair, as well as an afternoon informational briefing about the impact of traumatic brain injury. The event was hosted by the Congressional Brain Injury Task Force. At the fair, as in the Army, education about TBI is a top priority. "We implemented a policy in 2011 that mandated TBI education not just for medical providers, but throughout the entire Army," Goldman said. The efforts included particular emphasis on line leaders and commanders. "Brain injury awareness is not just a medical issue; it is an entire Army issue," Goldman said. "It's important our medical community and our warfighters partner together to understand brain injury and know when to seek help." Goldman also said she would explain to those at the TBI fair about some of the technologies the Army is using to help it better understand what occurs during a concussive event. Included among those technologies are the helmet sensors and blast gauges. After an injury, she said, early treatment is critical, and the DOD has implemented a theater policy to ensure early detection and treatment for Soldiers, Goldman said. The policy ensures a minimum of 24 hours of rest after a concussive event, even if a Soldier wasn't diagnosed with a concussion, Goldman said. It also mandates a follow-up evaluation to make sure a Soldier is okay to return to duty. Following a concussion, it's important to get the right kind of rest, Butler said. "People think they're resting -- but they're reading a book," she said. "That's not cognitive rest. You're physically resting, but your brain is still working. That's a huge education piece." Brain rest to recover from a concussion means sleep, Butler said, and that excludes watching television and playing video games. "That's one of the overall concerns for those deployed, is they don't get enough sleep. They don't rest."